This week I experimented with a new ritual. As you may or may not know, I use a walking stick when I’m outside of my home (I can touch something for balance throughout my home). I have LOTS of walking sticks. One is my favorite though. It’s a mega cool piece of sassafras I found in The Green Swamp (near my home). Sassafras just doesn’t get brittle. And the root of this particular stick is the perfect handle. So this is my daily walking stick. I re-paint it every few years. The re-painting process has always been pretty random. I do it when I can no longer stand looking at the scrapes and dents. In the past, I’ve re-painted it in colors I love; sometimes with words or symbols that mean something to me. Basically, I re-painted it just to make it look better. 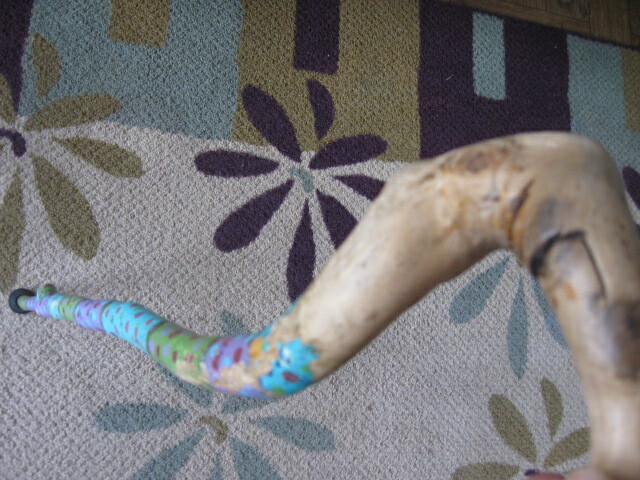 This week I decided that I’d re-paint my walking stick on my birthday. And I decided to make the process a little less random in another way ~ each year I’m going to re-paint my walking stick with reminders of how I want to live into the coming year. THIS year, I chose my favorite colors: purple, teal and green. I also chose my LEAST favorite color ~ orange. 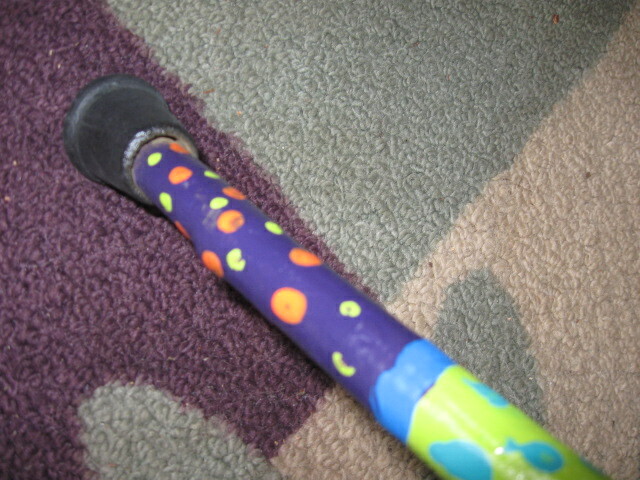 I placed 12 orange dots at the bottom of the stick ~ one for each month of the year/ and at the bottom ~ on purpose. I also chose to have no words or symbols this time. And the orange will remind me that what’s happening isn’t always what I’d prefer, but I get to decide how I roll with it. This was a FUN new ritual experiment ~ one that I’ll continue. What new rituals have you begun lately? Anything that has paint in it I have to love! I love ritual too. Little altars, making memories with my kids and grandkids, and new rituals too. I’m in the throes of building a series of sculptural pieces called Lost Childhoods, Mother Nature, Father Time, King Neptune, icons that have a meaning in our culture. I have a list and would love more! I’m working on the Grim Reaper right now and its really creepy and wonderful at the same time to think so clearly about what death and transformation mean to humans. The whole piece is fraught with ritual and it makes me think of rituals in a new way. In my life, a ritual I am establishing is to spend time walking with my 3 crazy dogs every day. I am determined to take that hour to fully BE in the world and no where else, rain, shine or sun. Thanks as always for a wonderful entry! oooo Rox, SO looking forward to seeing this latest creation of yours! and SO celebrating your In-The-Moment dog walking ritual. i know how sacred my morning walks with Blossom the Diva Dog are to both of us 🙂 THANKS! I just love the orange dot theory. You know it is often those things we dislike that force us to grow and shape who we are becoming. You are so right about remembering to roll with it!! & with your fabulous spirit pulling the positive lesson from the ick of life! So enjoy your experiments! Lisa-Loved reading about your new ritual! And I’m sure your walking stick enjoyed being rejuvenated and celebrated as well!!! Judi, yep. my walking stick is happy, indeed! LOVE the image of you on your “opened” front porch… especially these past mornings (after The Storm). grateful to know you’re safe AND that your power has been restored. grace & blessings abound! as always, THANKS for letting us hear from you ~~~holy, holy, holy.